Saint Vincent and the Grenadines with its capital Kingstown is located in North America (Caribbean, islands between the Caribbean Sea and North Atlantic Ocean). It covers some 390 square kilometers (twice the size of Washington, DC) with a population of 102,089. English and French are the languages spoken by people in Saint Vincent and the Grenadines. There are no land based border this country shares with any other country. Saint Vincent and the Grenadinesis an island nation in the Caribbean, north of Trinidad and Tobago. Bananas and other agricultural products remain the staple of this lower-middle income country's economy. Although tourism and other services have been growing moderately in recent years, the government has been ineffective at introducing new industries. The island is relatively small, but the mountainous landscape makes it difficult to get around. The main highways run along the coasts and as such it is necessary to drive around the whole of the island to get from one side to the other. The terrain is volcanic, mountainous. The average density of population is about 262 per km². The climate in Saint Vincent and the Grenadines can be described as tropicallittle seasonal temperature variation, rainy season (May to November). Possible natural disasters include hurricanes, La Soufriere (1,234 m) on the island of Saint Vincent last erupted in 1979; the island of Saint Vincent is part of the volcanic island arc of the Lesser Antilles that extends from Saba in the north to Grenada in the south and La Soufriere volcano on the island of Saint Vincent is a constant threat. To reach someone Saint Vincent and the Grenadines dial +1-784 prior to a number. The local cellular networks are operated on 850 MHz, 900 MHz, 1800 MHz, 3G. Websites typically end with the top level domain ".vc". If you want to bring electric appliances (e.g. battery chaarger), keep in min the local 110 V / 230 V - 50 Hz (plugs: A, B, G). The sign for the locally used currency Dollar is XCD. 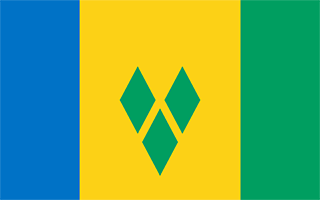 Three vertical bands of blue (hoist side), gold (double width), and green; the gold band bears three green diamonds arranged in a V pattern, which stands for Vincent; the diamonds recall the islands as "the Gems of the Antilles" and are set slightly lowered in the gold band to reflect the nation's position in the Antilles; blue conveys the colors of a tropical sky and crystal waters, yellow signifies the golden Grenadine sands, and green represents lush vegetation.